1. What is your background? How did you go from writing the Technical Commentaries to writing AOTC Incredible Cross Sections? I was raised in a place an hour's drive outside the city of Melbourne in Victoria, the most densely populated state in Australia. Star Wars exerted a "severe" affect on my childhood, to the occasional consternation of my parents. I have a doctorate in theoretical astrophysics, and at the moment I carry out postdoctoral research at the Australian National University in Canberra. At the start of 1995 I began a "Star Wars Technical Commentaries" web site as a hobby. Using a video digitiser belonging to one of my younger brothers, I found that it was possible to (1) record and inspect fine details of the movies that weren't clear in officially released pictures, and (2) to spot mistakes in the official literature that had emerged because some authors tended to reference other licensed books without rechecking the canonical evidence. My site kept growning: sometimes at rates of tens of MB per week. After a few years I entered a period of student poverty, and I was going to take the site down... but I gratefully accepted the hospitality of TFN instead. I know very little about the process that selected me as an official author, but I am grateful to three people I believe to have been involved. When David West Reynolds was at Lucasfilm he once proposed that I might become officially useful, and he asked what kind of book I would like to write if I had the chance. (That's another story.) I suppose that a year or so went by, and one day I received an e-mail message from Lucy Wilson, requesting a copy of my curriculum vitae. Much more time elapsed and then Simon Beecroft approached me with a proposal from Dorling Kindersley Publishing. 2. What was the writing process like for the book? What guidelines were you given and how did you interface with the artists? My guidelines were to interact with the artists and produce text in a format that is consistent with the previous cross sections books, up to a certain word limit. However on my first day at Skywalker Ranch with the DK team, Lucy Wilson gave me one more implicit guideline. She asked me to consider what distinctive difference a physics PhD could make to a Star Wars book, and she advised me to exploit that distinction. I sat with the artists, Hans Jenssen and Richard Chasemore, in long and stimulating brainstorming sessions at Skywalker Ranch. Later, while the artworks were sketched, inked and painted, we discussed every fine detail in e-mail discussions that sometimes involved multiple thousand-word mini-essays per day. It was a very energetic collaboration. 3. How long did it take to write the book? Did you mind ruining the movie for yourself so far in advance? What all did you get to see? We took about two weeks at or near Skywalker Ranch to invent and establish the basic features, history and physics. Then there was about seven months of high-bandwidth e-mail collaboration with the artists, while LF editors acted as a two-way connection to the movie's ongoing development. Partly in parallel, we took about two months for text revisions: (1) in order to squeeze everything onto the printed page; (2) to meet LF's requests for altered emphasis; and (3) to proofread the entire manuscript again. I suppose I spent a couple of hours after my day-job on most days, plus my weekends. Hans, Richard, Simon and I started at the Ranch in the early days of March 2001, about fourteen months before the movie was reported complete. Therefore our first exposure to the movie was a vast mass of concept art and reference photos. I read the script and spent my first morning writing detailed notes about it. We all spent an afternoon at ILM examining some of the models. Iain Morris at LF sent updated concept art and stills from the movie as they became available. I think we accumulated a trove of several GB of images. 4. 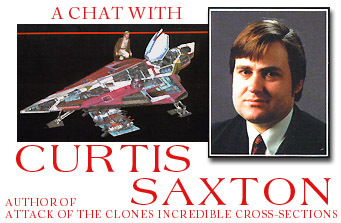 What was it like going to Skywalker Ranch and being allowed to see all of the Attack of the Clones secrets? There was a peculiar sense of deja vu at first. All dedicated SW fans have seen parts of Skywalker Ranch on television or the InterNet, so by actually going there, it feels like stepping into a not-quite-real world on the other side of the TV screen. I was conscious of the job I was meant to do there, so I didn't lose composure or do anything particularly self-indulgent. Since I have been thinking about complicated issues in Star Wars for years, I dived straight into the work. The only tricky bit is anticipating the development of a SW movie that is incomplete; one has to make educated guesses rather than resting upon hindsight all the time. In March the Ranch looks almost exactly like the foothills outside Theed. The building interiors are very cosy with many wooden surfaces; therefore the office areas feel a bit like the inside of the Wookiee house in the Star Wars Holiday Special. I also observed that odd animals called "newts" live in the river, and they crawl onto the road where some of them meet their fate. These distorted orange amphibians might have been the inspiration for Jar Jar Binks, but nobody at the Ranch could tell me for certain. 5. 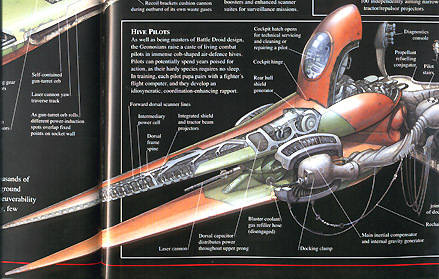 What types of suggestions did Doug Chiang give on the book? He was kind enough to meet with us for much of a day and we discussed most of the tentatively chosen topics of the book. We talked about his qualitative impressions of the role and capabilities of each object. He was able to tell us about many of the key structural details that were not obvious in the concept art that was available at that time. This gave us a crucial head start and saved us from some potentially false leads. Simon Beecroft and John Kelly were DK's editors for textual and artistic development of the book. However that understates their participation in what was a marvelous ongoing interdisciplinary discussion with the artists and I.
Iain Morris, Jonathan Rinzler, Chris Cerasi and Leland Chee at Lucasfilm graciously answered our many requests for additional reference imagery and information. They ensured coordination with the rest of the emerging body of AOTC work. Lucy Wilson (who leads LF's publishing efforts) joined the most important discussions, and she facilitated the project at the highest levels. Richard and Hans developed good relations with their peers in the Art Department and the Ranch. I recall that this was important when DK was granted the initiative to develop the AT-TE walker, which at that stage existed as only two concept pictures, and was not due for modeling or filming until months after our deadline. Ultimately everything in the Star Wars literature is inspired by or deduced from the work of George Lucas. Hans, Richard and I had no direct contact with him. However the important people at LF Licensing meet with Lucas frequently and they were able to obtain answers to questions raised during the development of our book. For example, I understand that the planet Rothana was named in an intervention by George Lucas. 6. What is your favorite ship or vehicle in the book? What makes it interesting? 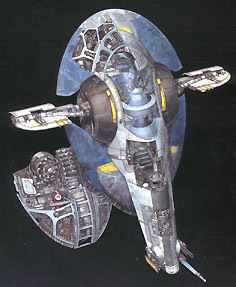 I adore the Geonosian fighter because it is so tremendously zany. It offers a deep glimpse into the lives of the ant-like Geonosians. It is interesting that SW has taken such an imaginative leap to portray an intelligent species with a sociobiology that is so very different from humans' (but equally justified). This spread is particularly memorable for me because at one point we were scared that the fighters might be cut from the movie completely, even though they were a prominent concept when we were at the Ranch. The AT-TE is striking to behold. When I first saw it I was immediately impatient for a model kit. It is a perfect extrapolation (interpolation?) of the mechanics and aesthetics of the walkers in the classic era. It might just as well have stepped out of TESB or Dark Empire II. And yet it is not slavish or derivative; it fits its own battlefield role with as much perfection and integrity as the AT-AT and AT-ST fit theirs. I took particular pleasure in proposing the name for this vehicle. The DK editors and I thought the walker looked so impressive that we substituted it for another subject that had been scheduled for those pages. 7. Was there a concerted effort to bridge the gap between the prequels and the classic trilogy? How so? In my personal view, there never was a big gap, so I suppose that the way I address this issue comes out of my basic assumptions. I always look for consistency and unity underlying the both the general technology of the SW universe (eg. standard equipment of the Galactic Republic / Empire) and underneath the flourishes of local novelty and diversity (e.g. Geonosis, Kamino, Naboo or Bespin in the classic trilogy). I try to keep sight of the common aesthetic and technical elements inside all the machines. The military craft in AOTC seem especially familiar and they fit seemlessly into the aesthetics and the functional roles of hardware in the classic trilogy. I think this is partly because comparable equipment is used in comparable struggles. From an extra-textual point of view, I think all of the artists have done a sublime job re-expressing the practical, functional aesthetic which is distinctive of classic SW.
For the cross sections artworks, our efforts at visible continuity concentrated on small specific things like: the style of the reactor systems inside the military transport ships; the cargo transit shafts and holds inside the Trade Federation core ship; and the panels and controls inside the AT-TE. Another example: if you look carefully in the front painting of the LAAT gunship, you'll see an emergency locker with a globular battlefield medic droid. This benevolent machine is similar to the relatively sinister interrogation droid in ANH; it is actually inspired by the grey Imperial medical droid in "The Great Heep" cartoon from 1986. On the other hand we had to be careful to portray the clear exoticism of local, indigenous vehicles like the Geonosian fighter and Dooku's sailer. Geonosians use their own standard parts which are just as capable as (but not necessarily interoperable with) the components you would buy elsewhere in the galaxy. A sense of consistency must naturally emerge from the fundamental fact that entire SW saga occurs in the same universe. I think that if we keep that perspective clear then all the rest of our work falls into place. The galactic civilisation is vast and almost timeless beyond our personal comprehension: its greatest institutions are thousands of generations old, and their basic technologies were optimised and became widespread even further in the past. The galaxy is divided into about a thousand sectors, with about million fully enfranchised member worlds, each of which has a retinue of dependent colonies and numerous barren resource systems. This vast scope confounds the imagination, but there are ways to write about it tangibly. Thus I tried to write "big picture" anecdotes that mention places and events unseen in the movie, yet related to the cross sections. I hope that enough of these tidbits survived to the final edited draft. 8. Did anything not make it into the book that you hoped to put in? Many things. For almost every page, the first draft of the text was two or three times longer than the final version. However the book must conform to the practical limits of a reasonable format. We expended enormous editorial effort attempting to squeeze and preserve the largest possible fraction of the original ideas. I am grateful to Simon Beecroft for his patience throughout that process. We considered showing some of the big war droids in action on Geonosis, and I began detailing their technicalities and histories. However we ran out of time and there was little prospect of receiving detailed visual reference photos within our publication schedule. So my editor said he'd rather reserve that topic for future developments. In hindsight, I think that the quality and diversity of designs in the Battle of Geonosis could fill an entire book by itself. 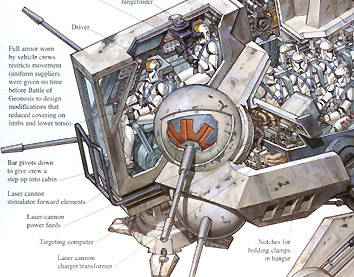 The clones also used some self-propelled artillery pieces alongside the AT-TE, which we called SPHA/T = Self Propelled Heavy Artillery / Turbolaser (and equivalently SPHA/I = ion cannon). However we didn't have time to include those either. The clone pilots and gunnery crew were going to have a practical uniform; they were going to be analogous to the AT-AT crew in TESB. That idea became caught in an editorial limbo, so we had to say that the armourers on Rothana were still developing the ergonomically appropriate gear, and it wasn't available for the Battle of Geonosis. I hoped to explore the motivations of the Separatists, the methodologies of the corporate powers and the consequences of the increasingly disfunctional nature of the Galactic Republic (eg. remote worlds left in isolation; crop worlds left to rot due to tariff escalation; city planets plunged into famine and cannibalism due to terminated imports). I was also interested to portray the Naboo people multi-dimensionally, especially their defensive reaction to the trauma of mass internment and starvation in TPM. However it was only possible to connect a few of these ideas directly to the vehicles, and I conceded that the rest was outside the scope of the present book. 9. What is the biggest scientific stretch between reality and fantasy in the book? What pushes the sail on Count Dooku's ship? The area of the sail is too small to catch or reflect enough sunlight, solar wind or any other widespread natural phenomenon to provide the kind of accelerations that typify even the slowest starships in Star Wars. If a sufficiently concentrated natural energy source were available throughout an entire galaxy then its presence (especially its gravitational effects) would have altered the overall structure of the galaxy and stars. The sail must be pushed by locally concentrated, directed, artificial beams of a kind that may move faster than light. However LF was reluctant to introduce a dedicated galaxy-wide network under the Geonosian control, nor parasitic use of power from the Galactic Republic's HoloNet hyperwave communication relays. If I recall correctly, they didn't like the potential for other organisations to misdirect the same power source to insidious ends. Therefore we invoked a more obscure and indirect explanation. 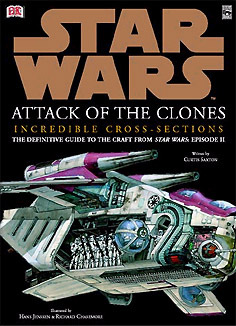 We side-step most of the problems by attributing Dooku's unique sail to the fallen prehistoric super-civilisation of the Gree (from the old WEG roleplaying game). Bizarre and poorly understood Gree relics continue to operate during the classic trilogy era. The devices that remotely push Dooku's sail are presumably sitting forgotten in the ruins of a lost world, unknown to Dooku himself. The Count, however, is known as a man of fine things, so it is fitting that he uses an ancient, precious and superficially paradoxical artifact. 10. If the clone troopers were created in secret, where did all the gunships and Republic cruisers come from? "Regional variation" answers most questions of this kind. The big military hardware came from a very secure industrial world named Rothana. I understand that Lucas named that world himself. I think I proposed that the natives are furry, hippo-sized lobster-like intelligent creatures. Anyhow, they are a regional subsidiary of Kuat Drive Yards, which has good reasons for supporting the galactic government and staying apart from the other major separatist/corporate powers. Like a handful of wealthy sectors, Kuat Sector is able to manufacture and maintain sectorial defense fleets which are supposed to be comparable in size and power to the ships of the Imperial Starfleet found more widely in the classic trilogy. However because of frustrating trade limitations imposed by the Trade Federation, little of this equipment can be sold elsewhere in the galaxy, and they mostly have short-range hyperdrives. Outer Rim sectors make do with a diminutive scale of "dreadnaughts" which are so ubiquitous in the old West End Games sourcebooks. They're hundreds of metres long instead of kilometres long. Were there any other gaps you had to fill in from the script? I wouldn't call them gaps. I'd rather say we had the privilege of defining the back-story for almost everything in the book. Because DK started work so early, we preceded most other licensees. With the exception of the history of the Fetts, most of the information in the book that doesn't appear explicitly in the movie was actually developed by the DK team in consultation with the authorities at LF. * Cameo by the young Senator Greyshade. * Checking that the gunships would fit out the hatches in the transport ships (they didn't fit according to the first animatics we saw). * Why and how the Trade Federation core ships were landed. * The meaning of the "cog" logo of the Galactic Republic, and some other pre-Republic history which could not be printed: concerning the Bendu Monks who evolved into the Jedi and the Unification Wars that formed the Republic. * Painstaking fixes to the paradoxes of the Delta-7 Aethersprite: how the droid was able to fit, and how "a fighter that size" could get into "deep space on its own." Thanks to Curtis for taking the time to answer questions. You can correspond with him via the Star Wars Technical Commentaries.